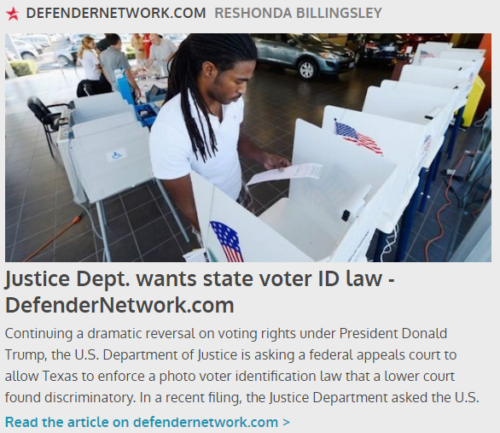 Defender Network is reporting that the Trump Administration, specifically the US Justice Department, is trying to help Texas get a Voter ID law reinstated after the federal courts determined the facts of the case an the fact is Texas state legislators intentionally set out to disenfranchise non-white voters. On the subject of the act of voting which has many critics among nonwhites, who claim it never “matters”. If it did not matter some one should tell that to these legislators across the nation who have recently and historically expended resources to keep non-whites from voting. Methods that include not only legislative methods but to outright murder of non-whites who attempted to vote.